Wherever you point your camera, chances are someone has already taken a similar shot. So how do you avoid the cliches and make images that are truly your own? We look at 16 of the top street photography cliches to see how talented photographers transcended the obvious to create unique and memorable images. Hit the jump to see them all! In literary terms, a cliche is defined as a phrase or opinion that is overused and betrays a lack of original thought. Visit any street photography group on flickr and you’ll see how the word applies to our world! Street photography cliches thwart creative potential by alllowing photographers to lean against an existing idea to create images that look like something else. Of course, it’s natural to be influenced by the things that you see – in fact, it’s human nature. But how can you be influenced by the things you admire without simply copying them? The trick is to make every shot your own. Let’s look at 16 of the most popular street photography cliches and see how individual photographers rose above the cliche to make truly memorable photographs. 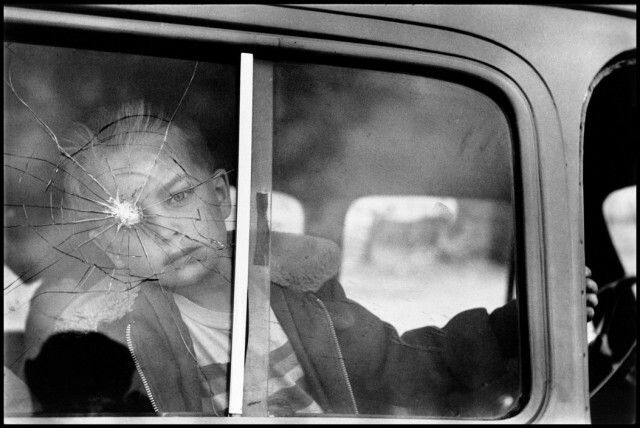 Elliot Erwitt took his famous shattered glass shot in 1955 (see article intro). But how can you resist taking the shot when you see someone peer our from behind a shattered pane of glass as their eye lines up with the center of the shatter. It looks like street photgraphy gold but it’s just a street photography cliche. 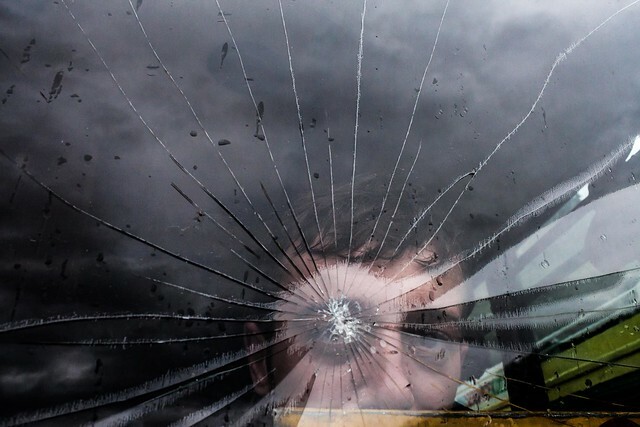 Dimitris uses the shatter in his photography to break up the reflection and create and abstracted sense of reality. The shatter, the subject and the environment all work together to create a striking image that is both memorable and haunting. The shattered glass brings meaning to the frame and narrowly escapes being a cliche. How many shots have you see of people holding an umbrella. And that’s it. It’s just a picture of someone holding an umbrella. Often while walking past. It’s boring and it’s a street photography cliche. Kasapidis solves this problem nicely by juxtaposing his own umbrella with that of a stranger. The interior of his umbrella is lit by flash creating a monochrom almost surreal overhang for the backlit and colorful umbrella of the stranger. The strangers face is mostly in shadow with only his chin being lit by the sun and this mimicks the difference between the photographer’s umbrella and the colorful one of the stranger. 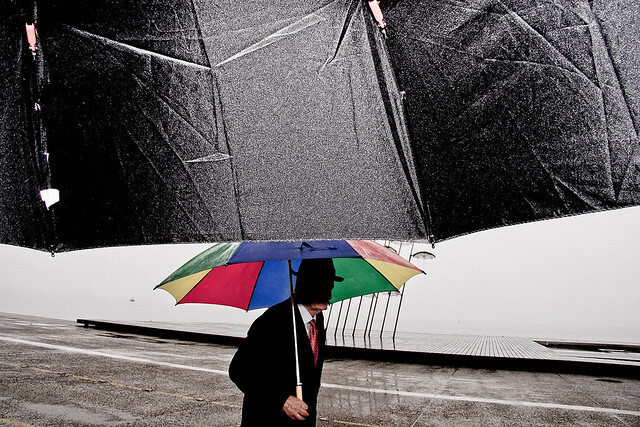 This juxtaposition elevates the shot and it’s more than just another umbrella shot. Definitely not cliche! We’ve all been there. You’re in Lightroom looking at a terrible shot of someone walking through a puddle when it suddenly dawns on you to just flip that frown upside down and boom! Street photography cliche. 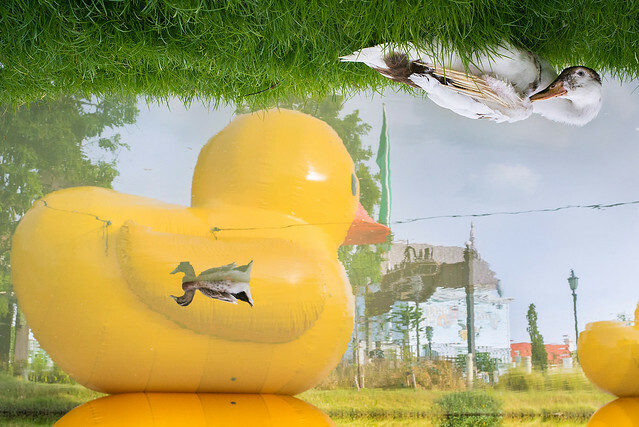 But Tavepong really takes the concept a step further and creates a surreal hellscape where rubber ducks and regular ducks battle for pond supremacy. The duck in the top right completes the effect with his twisted head that’s right side up even when he’s standing on the ceiling! The shot even works if you flip it right side up but the upside-down image creates a surreal quality that is fascinating on many levels. Nothing says street photography cliche like a picture of a solitary figure on a very long escalator. Especially if the person on the escalator is wearing a hat! And yet we cannot resist taking that shot every time we see it! Rinzi Ruiz nails this shot with a rare color composition that divides the frame and focuses our attention. The three figures in the frame form a lovely triangle that plays off the curves of the ceiling and the single shaft of light perfectly intersects with the man’s head. The shot is less about the man on the escalator and more about a communal moment frozen time as the escalator continues its endless turning. Very well seen! It all started with Elliot Erwitt’s shot of the bulldog sitting on his master’s lap. The dog’s head perfectly aligned to replace the human’s and another street photography cliche was born. 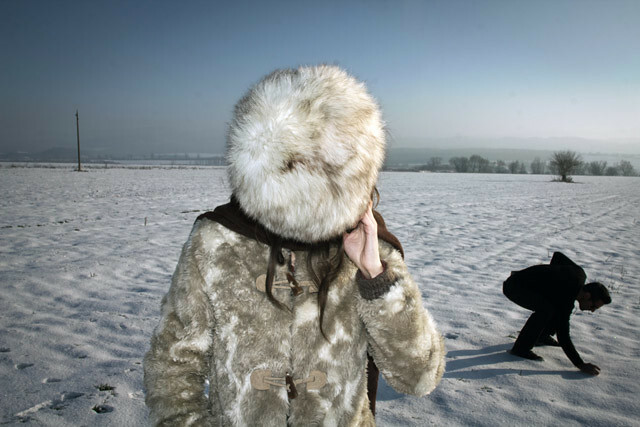 Dirty Harry takes this idea a step further by letting the fur hat that obscures the woman’s face create a sense of mystery in the frame. The shadowy figure (is that a statue?) bending over in the background draws your eye to the frigid landscape and an eerie sense of wonder is created as the pair resonate off each other. It’s a great shot that avoids the quick visual pun and creates an image that works on many levels. It’s so easy to see and even easier to shoot. It’s no wonder the fake face from a magazine is one of the most popular street photography cliches! But Nick really ups the game with perfect alignment and a simple presentation. 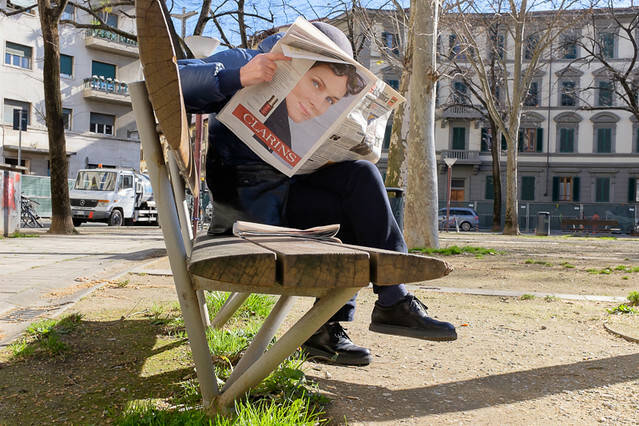 The girl’s face is enchanting and the lines in the image on the back of the newspaper perfectly align to create a body shape with the man on the bench. If you’re going to do it, then you might as well do it right. And Nick did it very right! First you see it out of the corner of your eye. The looming advertisement (sp) that looms in the background. Begging you to line it up with the next thing that passes by. And… Street photography cliche. In all fairness, I’m pretty sure Matt Stuart invented this kind of shot and this particular image is, in my opinion, the first and last one of these that ever needs to be shot. 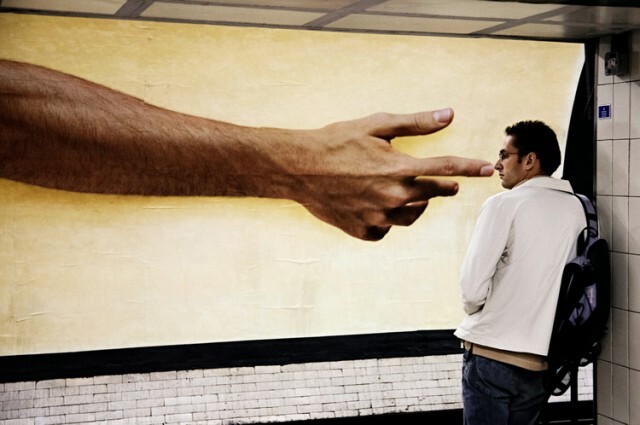 There’s perfection in the large hand reaching forward to poke the commuter in the nose just as he turns his head at the exact right angle. But I see more than a simple visual pun in this image. It brings to mind Michelangelo’s The Creation Of Adam where the finger of God hovers a fraction of an inch away from David’s finger. Did he touch him already? Is he about to? Matt’s image is layered with similar conjecture and while it may not reveal any secrets of the meaning of life, it stands out as the seminal shot of its kind. Feet don’t fail me now! All you need is an unusual sign and the right person standing behind it and woop, there it is! Another street photography cliche. But humor and execution really pull this shot from Pau together. It would have to be just the right shoes to be incongruous yet plausible for Santa to wear. And he nailed it. 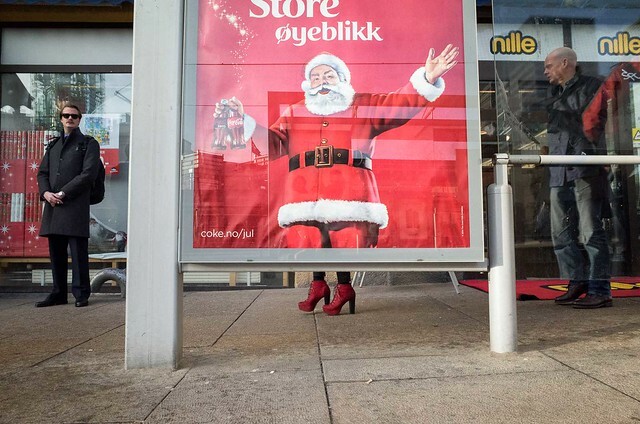 Plus the subtle gesture of the feet as the shuffle along is hilarious when compared with Santa’s stance in the sign. He’s overjoyed with his new shoes! Wry wit and excellence of execution elevate this shot for me. The form and subject are perfectly blended to create a delightfully unique statement. Really well done! Car windows are the frames that define the world on our daily journey. And the side mirrors are the frame within a frame within a frame that can reveal the world in unexpected ways. And it’s another street photography cliche waiting to happen. Simon’s shot uses the passenger’s bare leg and the car’s pillar to focus our attention inexorably on the smallish mirror. Color contrast gives the scene an almost 3 dimensional feel as the mirror lights up with a spectacular sunset that’s already in the car’s past. It’s just not a picture of a mirror, it’s a monument to every roadtrip we’ve ever taken that plays out like a familiar memory. What a shot! It could be a smoke stack, airplanes or even another person’s head. But the second you line it up and create the impression that it’s coming out of someone’s head you’re at risk of creating another street photography cliche! Ksenia’s shot rises above the crop with a clever optical illusion on top of a weary man’s head. The off-kilter horizon suggests the image was seen and shot in an instant rather than being posed and the fleeting nature of the moment strengthens the visual appeal. 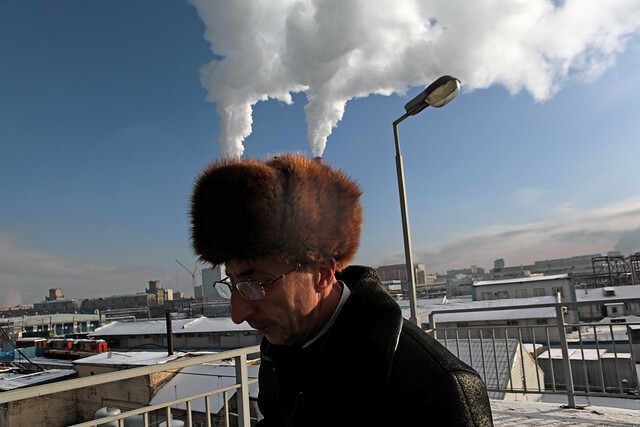 You can almost feel the chill in the air as his fur cap explodes with the fury of smoke from the smoke stacks behind him. The barren city scape strengthens the sense of cold and reinforces the heat rising from his head. It’s a humorous and touching image that stays with you. I first saw this effect in Trent Parke’s Minutes To Midnight but it’s more commonly seen when flash shooters over expose the foreground and mute the background in the process. It creates an eerie ghost-like quality and it’s become a street photography cliche. But Oscar_from_Denmark’s image is a careful construction that expertly uses the effect to create a sense of awe and wonder. 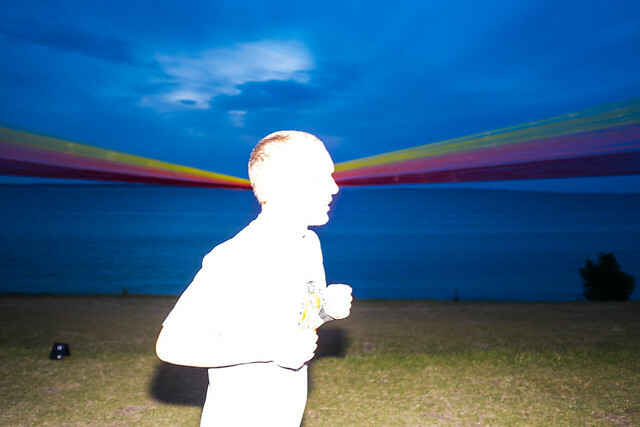 The over-exposed runner is bisected by the colorful rainbow that seems to be exploding from his head. And the hint of sunlight in the dark blue sky suggests that he’s bright enough to light up the sky. It’s an interesting image that rises above the technique to create a whole new world. Weary commuters on their way to and from work shot through a bus window. The thin plate of glass creates a frame within a frame and acts as layer of safety between the photographer and the occupants and acts as a force field that protects street photographers from their dismal journey. And it’s a street photography cliche. Nils Jorgensen’s shot proves that the a simple detail can elevate let any shot transcend the cliche to become monumental. The whimsical silly string sprayed on the bus window intersects the young woman’s forlorn gaze and creates an image that is at once abstract and beautfully grounded in reality. It’s an wonderful image that stands on its own! 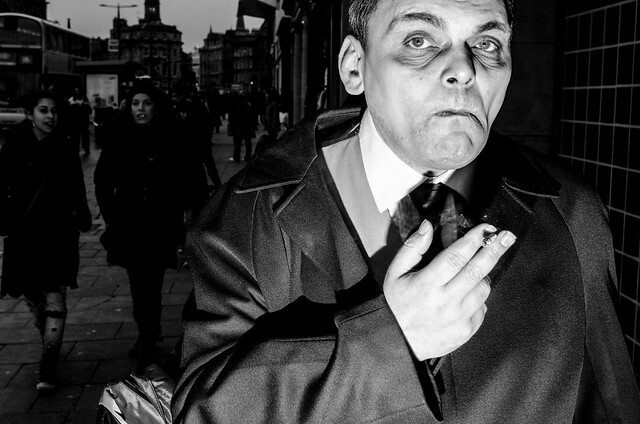 Bruce Gilden’s in-your-face style of shooting with a wide angle lens and flash on the street produces results that are instantly recognizable. So much so that they’re now a street photography cliche. But while Gareth’s shot nods to the gruff but lovable Gilden, he brings his own vision to the experience and the subject stands out as being more important than the process by which it was created. His ghastly almost ghoulish expression is eerily captivating and the darkened background feels haunted in his presence. This is a great example of using technique to tell an original story rather than simply copying someone else’s style. Great shot! Vivian Maier rocketed to stardom after her death when her negatives were discovered in an abandoned storage locker. Her austere self portraits with camera in hand captured the imagination of many photographers who suddenly saw any reflective surface as a selfie waiting to happen. Vivian might have cringed at the thought but another street photography cliche was born. Ochaviere’s “Giraffe Man” uses two mirrors to create an alter reality where his neck is extended to comical proportions. It’s a humorous take on the mirror selfie that uses the environment to create something new that most people would have missed. It’s too soon to tell but this extended human motif might end up being it’s own street photography cliche some day! Vivian Maier might have been the queen of selfies but Lee Friedlander was the king! Friedlander found his own image fascinating and disturbing but was able to find humor in those feelings and his shadow is a common theme in his images. For every mirror that gets overlooked another street photographer points his camera at the ground and sees his own shadow and we get six more weeks of street photography cliches. 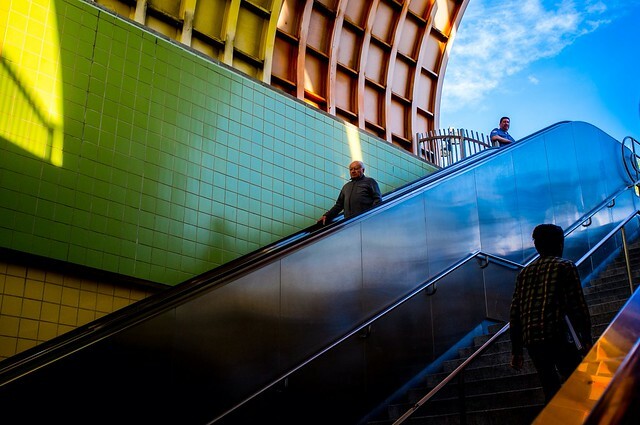 I see Chris Leskovsek’s image as more of a nod to Friedlander than a cliche. 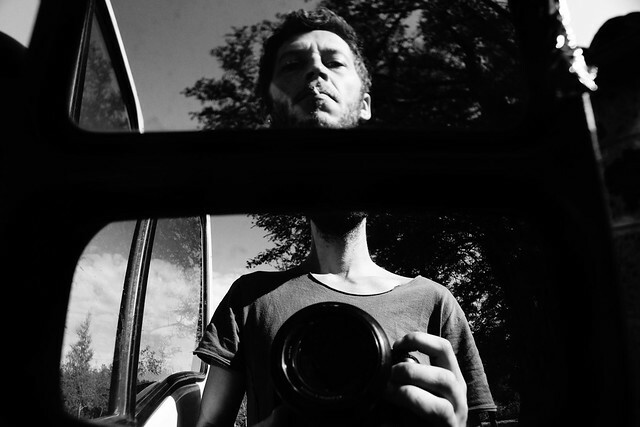 He captures the subtle humor of Friedlander’s selfies with the whimsical line that shoots out of his shadow’s head. And his nonchalant pose suggests an understanding of his shadow as more than a graphical element in the frame. It’s a reflection of himself projected on the world. Very Friedlander. And a cool shot too! Whenever there’s a chinup bar on a beach you’re bound to find a street photographer darting around with his camera. It’s considered by many to be street photography gold but it’s still a street photography cliche. This is one of my own shots, so of course I’m a little biased. I really tried to avoid the trappings of showing guys doing pullups at various angles and looked at the scene as a series of vignettes. 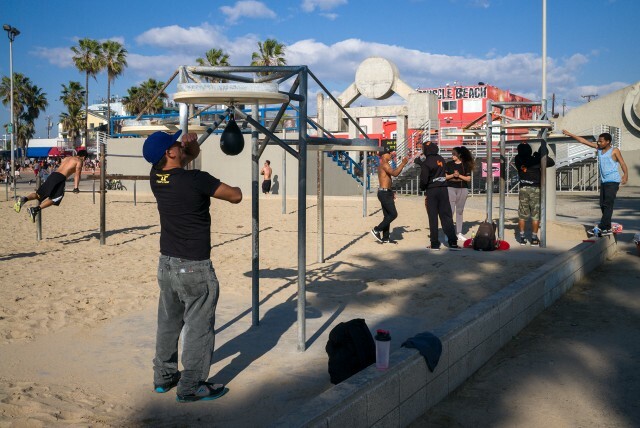 The boxer on the speed bag originally caught my attention before I saw the two shirtless men in the background. I was fortunate to line up the one guy in the bars beneath the bag just as a third story played out with the firends greeting each other on the right hand side. I tried to tell an extended story rather than simply composing around some guys working out. You could argue that every shot has already been taken so there’s no need to worry about cliches. And to a certain extent, I agree. But street photography cliches can become a crutch, a way to create images that look good but are empty. They don’t include your unique point of view. What sets each of these shots apart is the photographer’s ability to take a familiar theme and tell a new story with his/her own voice. It doesn’t matter that you’re shooting through shattered glass so much as it does that you’re making your own statement in the process. How does the broken glass describe your subject? Is it critical to your message or are you just taking that same shot again? And you find yourself over time that you take fewer pictures because you’re going over the same neighborhoods and seeing the same things. And maybe in your mind you’ve already taken that shot so you don’t take it again. But being open to what’s around you is important. Don’t just go out and collect photos but take the time to see things with as much wonder and as much interest as you can bring to it. All the stuff that the normal people tune out when they walk down the same street and they’re on their phone or whatever. You need to be the opposite of that person. You want to be the one who’s seeing what’s going on around you. When you look at the world with interest instead of looking for photographs in the world then cliches seem to disappear. 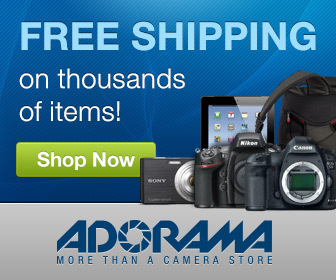 Even if you happen to be shooting through shattered glass! What’s your take on street photography cliches? Something to be avoided at all costs? Or a fact of life in a world where millions of pictures are taken ever day? Post your ideas in the comments below and keep the conversation going!